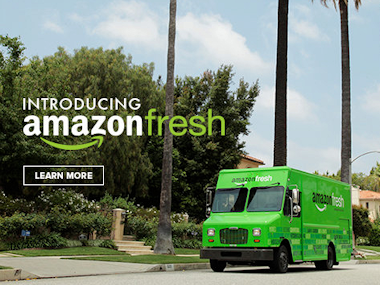 Amazon announced today that its AmazonFresh next-day and same-day grocery delivery service is expanding beyond Seattle and Los Angeles and into San Francisco, as AllThingsD reported last week was close to happening. With Fresh, which launched in Seattle more than five years ago and expanded to Los Angeles six months ago, Amazon will deliver foods such as fresh fish and produce, as well as an array of other products, including electronics and toys, that it is storing in its warehouse facilities, which have also been outfitted for refrigeration. For same-day delivery, items need to be ordered by 10 am; later orders will arrive the next morning. After a 30-day free trial, customers who want to use the service will have to step up and purchase a $299 annual membership to Prime Fresh, which also includes the normal two-day free-shipping benefits of Amazon Prime. That pricing is a bit aggressive, but Amazon must like what it is seeing in terms of adoption in Los Angeles to launch a third market so quickly after the second. In San Francisco, AmazonFresh will face off against a variety of competitors, big and small.